1.First, install Steel carabiners on the ceiling, two Steel carabiners spacing 50-80 cm better. Steel carabiners need to be installed on the ceiling perforated ceiling is not suitable for installation over the ceiling. (Installation must be able to load in a fixed object). 2.Then, if the ceiling is high, need an extension belt, extended with a length of 70 cm, anti-gravity yoga length from 1.4 to 1.5 meters, so the high ceiling that also can be used. 3.Finally, the anti-gravity yoga climbing hook both ends to extend the end of the tape just fine. 1.During use in strict accordance with the following points from seizure. 2. Yoga hammock hanging anchor must be strong, hanging upside down from the height of the first floor is not more than 15CM, to prevent accidentally fell wounded. 3. Please check before using yoga hammock hanging hook plate is loose, extended belt for excessive wear. 4.Avoid carry-on buttons or sharp objects are damaged and yoga hammock. 5. This product is not fireproof fabric; please stay away from sources of ignition. 6. Note yoga hammock clean the surrounding ground level, avoiding choose gravel, twigs and other sharp hard objects exist locations. Note: Accessories extension belts and hooks are not included. Perfect Size: Weighs just 5 lbs, Load capacity: 440LBS.Lightweight for travel and outdoor use. Its perfect size for most of the poses even completes stretching. Keep or share with loved ones also comes with a bag to take around to the park, beach or gym. Professional Design and Best Quality: Vibrantly colored and mild shimmer studio quality anti-gravity yoga hammock beautifully crafted from high strength parachute material fabric. Made from high strength parachute fabric. Yoga swing with 7 easy grip hand ? ? 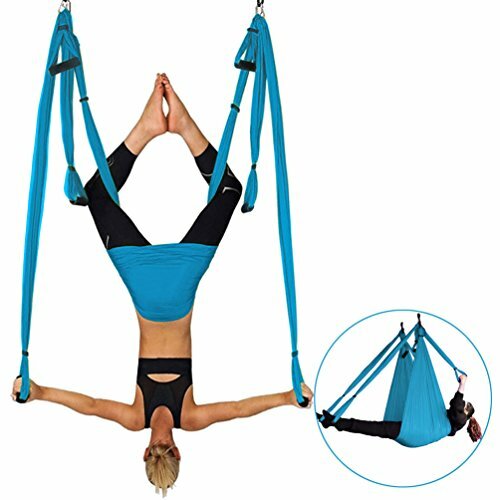 Benefits: Using it for inversion therapy for spinal decompression or upper body strength building the versatile aerial yoga sling to benefit your health. PACKAGE: Package includes: 1 x Yoga Hammock (102.4inch X55.2inch) with storage bag and 4 x Carabineer (Installed), 6 handles. Relieve back pain: Inversion therapy is amazing for your back, achieve instant traction on your spine. This is the most useful and powerful yoga inversion tool to improving your core strength, flexibility and relieves compressed spinal disk. 100% MONEY BACK GUARANTEE: If you are not satisfied with our aerial yoga swing. We¡¯ll refund your money, no questions asked. If you have any questions, please leave your messages, we promise to reply you within 24 hours and offer you best services.